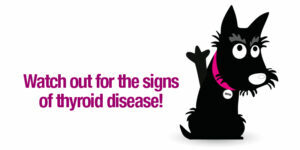 One of the companies we deal with (MSD) is having an advertising campaign to help raise awareness of thyroid problems so this seemed like a suitable topic to write a short article on. Dogs and cats (and people) have 2 thyroid glands, they sit one on each side of the trachea but they are very loosely attached so can be anywhere from the top of the neck down to almost in the chest. They control the rate at which our bodies metabolism works. Thyroid glands can be either over active (so your body ‘speeds up’) or under active (so your body ‘slows down’). The cause of this can be changes in the way the thyroid cells work (we don’t fully understand why) and it can be caused by cancers, although these are frequently benign. We also don’t understand why, but cats usually only suffer from overactive thyroid (hyperthyroidism) and dogs usually only suffer from underactive thyroid (hypothyroidism). Usually by a blood test. This is usually straightforward in cats and dogs. 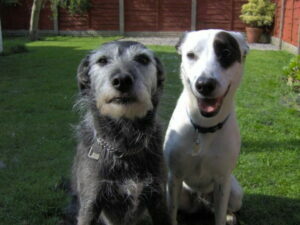 Dogs have a pill or liquid in the food. cats have a wide range of treatment options including pills, liquids, dietary change, a gel that is applied to the ear and radiotherapy to kill off affected thyroid tissue. 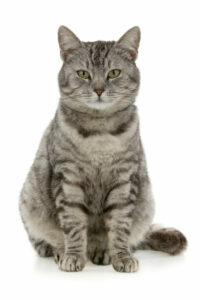 Cats can also have the affected thyroid gland removed. 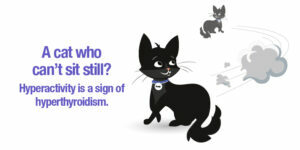 Both cats and dogs with thyroid disease usually respond very well to treatment and tend to live out prettty normal lives once diagnosed and treated correctly. As always, please ask us for more information.